Marlee Mambos, and my Favorite Moments of Ep11 | personal.amy-wong.com - A Blog by Amy Wong. Hey, guys~ Am watching Ep11 at this moment. 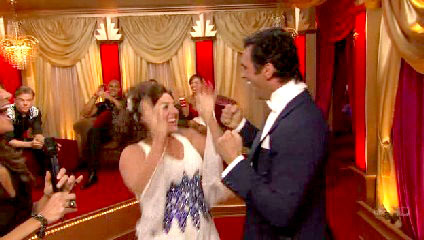 I think this might be my last post on Dancing with the Stars, for obvious reasons, non? Well, I do hope you voted for Marlee because 7 votes is a lot. Last Monday’s episode had a few cute and funny moments with Marissa Jaret Winokur, Cristian de la Fuente, and Kristi Yamaguchi. Marissa always makes me smile, lol… with comments like she’s “more like a moth,” in response to being like a butterfly for the Viennese Waltz, and her flipping out with her scores. And her saying that she’s only seen 9s in rehearsals, pretending… ha! And I enjoy the Latin American and Asians representing… Kristi rocked it with her Jive, and her flipping out was funny too.